Sonali Bendre flies back to her home Mumbai on a short break who is bravely fighting cancer for months in New York. 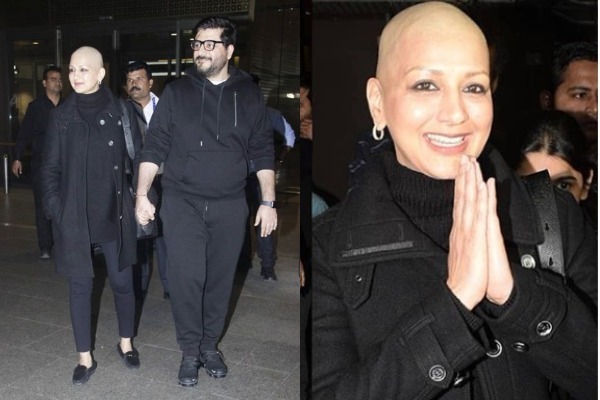 Sonali Bendre is one brave soul who did put her journey of cancer battle on social media and created awareness that it’s ok to share when you are not normal but it’s not ok to hide and leave with it in pain. With no second thoughts, Sonali constantly keep updating her Instagram account with all the latest progress and kind of life she is been leaving since the time she put a brave fight against metastatic cancer for months in New York. From embracing baldness to trying different wigs(which Priyanka Chopra helped her with) to living a cent percent life of what her Instagram post hashtag says – #OneDayAtATime, Sonali Bendre Behl is stand strong and tall like a rock while undergoing treatment for ‘high grade’ cancer in New York. Having such a loving and caring husband Goldie Behl is Sonali’s source of strength and positiveness on this life’ toughest battle. Though it’s long journey Sonali have to take, she is back in Mumbai for a short and happy break. As the actress touched down Mumbai airport with her husband, she happily allowed the paparazzi to click her bald look which she is totally embracing it and loving it. As she moved towards exit, she greeted the media and received recovery wishes from the photographers and fans.